GRE tutoring from MyGuru is a customized experience consisting of upfront diagnosis of strengths and weaknesses, development of a customized study plan, personalized tutoring, assignment of weekly homework, and periodic full length GRE practice tests to track progress. Our GRE tutoring is delivered in your home, local library, or coffee shop. We offer 5, 10, or 15 hour packages, as well as tutoring by the hour. Sessions are available in Chicago, Boston, Minneapolis, New York and several other cities – or online using a virtual whiteboard. We follow a GRE tutoring process that is tailored to every student. Before the first session, students are asked to purchase the Official Guide to the GRE General Test and complete a practice test to identify strengths and weaknesses. The first session involves a review of this diagnostic test, an overview of each section and question type covered on the GRE, and development of a customized study plan. This is followed by a series of sessions in which strategies for each section of the GRE are reviewed and practice problems are completed. 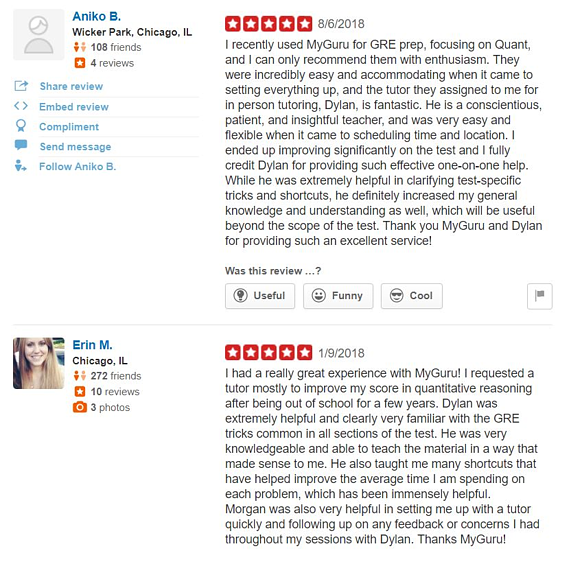 Click here to read more reviews from students who have invested in private GRE tutoring. Our base hourly rate for private GRE tutoring is $99, with 5, 10, or 15% discounts for investing in 5, 10, or 15 hours in advance. That's a long term rate of $99 × 85% = $84.15 per hour. After the first session, if you then choose to continue with a 15 hour package, that's a total cost of $84.15 × 15 hours = $1,262.25. We encourage you to check around for a better value. Typical hourly rates for 1-1 GRE test prep from an instructor like John can run well above $150 at other companies.